The latest update, 1.04, is out! To update your existing installation, just run your tdm_update.exe file. The download size for upgrading 1.03 to 1.04 is about 260 MB; a fresh download will be about 2 GB. This update provides a number of new assets for mappers, including mage and thief characters, new vocal sets, and an improved LOD system. Players will also benefit from smaller saved game sizes, more intelligent AI pathfinding, and greebo’s brand new mission preview screen (see image). 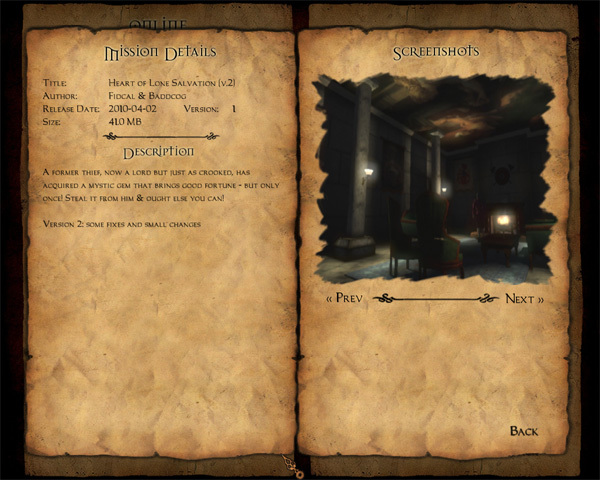 Players can now see details and screenshots of missions before choosing whether or not to download them. Note: While missions are fully compatible with this release, you can NOT load any previously saved games after updating to 1.04. If you’re in the middle of playing a mission, you might want to finish it before updating. This entry was posted in News by greebo. Bookmark the permalink.